Solo Paper Portion Cups These Paper Souffle Portion Cups use heavy duty multi-pleated paper with a rolled wax trim. They are very durable and can contain condiments and other liquids without seepage or deforming. This product is often used to dispense dry medications. After use, they are easily disposable. The manufacturer of this portion cup is Solo Cup. This company also makes a Plastic Translucent Cup and a 3 oz Paper Medicine Cup. 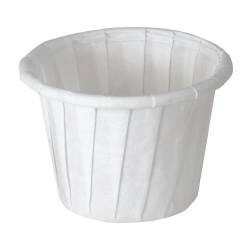 The paper souffle cup from vitality medical was much better priced than any of the other souffle cups that I researched online. The thin wax coating is sufficient to keep the cherry juice from leaking through the cup. I am quite satisfied with this product.